My taste in games has altered over the past few months. I am less and less willing to put thirty hours, much less forty, sixty, or eighty, into a game. Although I spent last year playing some long games (most notably Final Fantasy[ies] 7,8,9), I’m increasingly done with it. At the same time, my desire for shorter games has meant that I want to actually enjoy the time that I’m putting into the things. Long games depend on the balance between boring segments and exciting pieces to bend heavily into the latter category; if I sink 40 hours into a JRPG, I’m directed (through design, through narrative) to remember the best parts. That doesn’t work for a game that lasts for two hours. I want to be entertained, to be drawn in, for the entire time that I’m playing. The time constraint is a good one, and shorter games like Dear Esther, Kentucky Route Zero, and Tomb Raider have captured my imagination significantly more than Skyrim, which I have put 124 hours into compared to the 20 or so hours (combined) that I have in the games I listed. Monster Loves You! is a short game (also a game with a terrible title.) I have played through the game a single time, and it took all of 37 minutes. At $10, that’s a pretty steep time-to-money ratio, but let me assure you: the game is worth it. 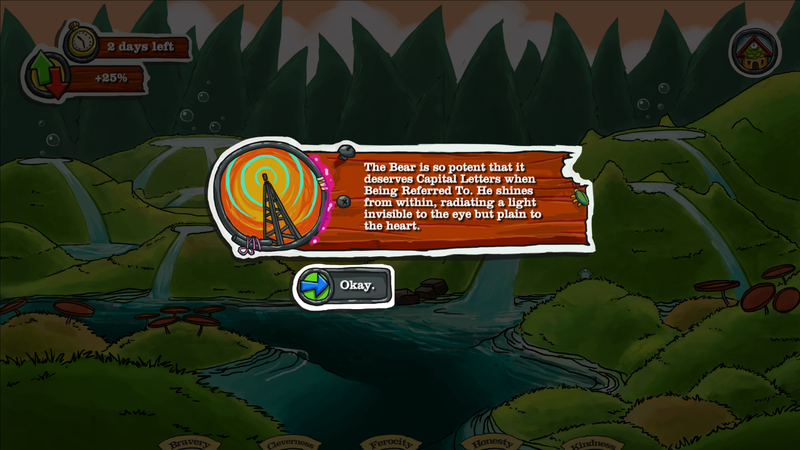 The game is, at the bottom, a choose your own adventure game with a little more complexity. The game begins when you, a monster, are born at the bottom of the communal spawning pool. This moment of birth is combined with a moment of developing agency, and from that point onward the game is driven by decisions that the player makes. Early on, these decisions are both personally formative and social. For example, the player will be presented with a prompt like “you and another monster were wrestling and broken an expensive vase. You were caught. What do you do?” (the writing is much better in the game proper, I promise.) Your decision, chosen from three or four options, gives you points in one of several categories. These categories are varied–kindness, ferocity, and bravery are among the possible personality traits that the playermonster can develop in the early game. What makes Monster Loves You! interesting is how the player is corralled into decisions. During the early parts of monster life, these different qualities of character can be raised and lowered fairly easily through interactions with other monsters, social problems, and wandering around in the forest. 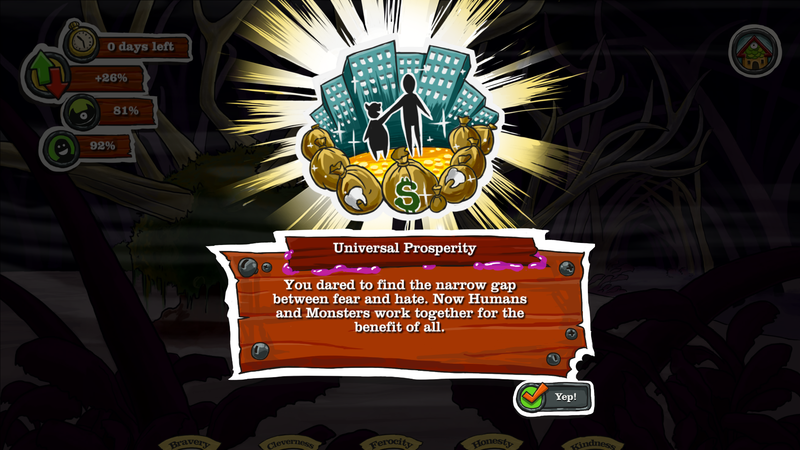 At the halfway point of the game, however, the focus changes–as an adult monster, your responsibilities change to be focused on human/monster relations. At this point, most of your personality traits are “locked in,” and the game becomes a process of navigating politics through your crystallized monster being. Monster Loves You! is somewhere between a dating sim, the moral choices of a Mass Effect game, and a text adventure game. The choices that one makes, and the opportunities that one has, change every game. No monster grows up the same. Not every moment and problem is solvable by the monster the player has at hand, and there were times in the game where I wished that I had been more brave as a child, or been more ferocious, so that I would have more tools with which to make monsters less afraid of humans. 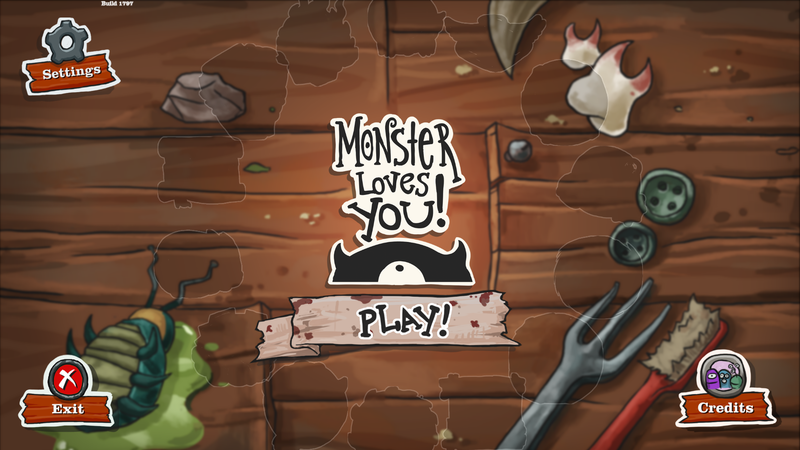 In a world of heartless AAA titles and narrative grand standing, Monster Loves You! is a breath of fresh air, and I wish I could play more games like it. This entry was posted in Video Games and tagged art, CYOA, mass effect, monster loves you!, video games. Bookmark the permalink.